Members of the U.S.A.F. 's 3rd Space Experimentation Squadron (3rd SES) gathered to say goodbye to the Automated Navigation and Guidance Experiment for Local Space satellite during a final command ceremony at Schriever Air Force Base, Colorado, on November 20. 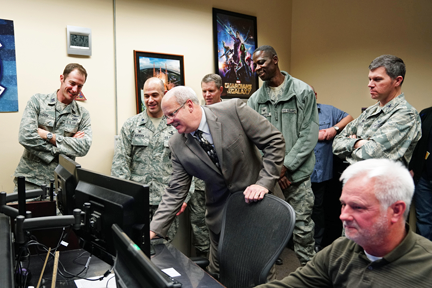 Dr. Joel Mozer, Air Force Space Command acting chief scientist and technical advisor, sends the final command to the now-decommissioned the Automated Navigation and Guidance Experiment for Local Space satellite at Schriever Air Force Base, Colorado, Nov. 20, 2017. Mozer had satellite control authority during the beginning stages of ANGELS in 2014. U.S. Air Force photo by Dennis Rogers. ANGELS was an experimental satellite that tested the boundaries of orbital mechanics and capabilities of space systems. 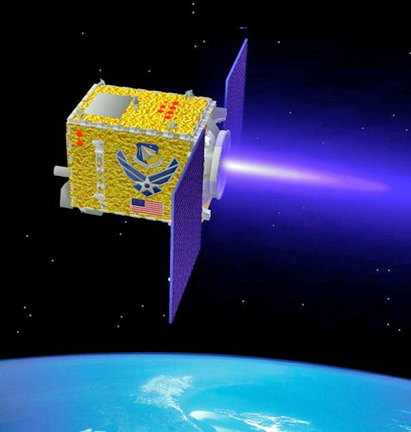 The satellite was launched in July 2014, which was initially managed by the Air Force Research Laboratory’s Space Vehicles Directorate at Kirtland Air Force Base, New Mexico. The satellite was designed to demonstrate automated spacecraft operations, advanced Space Situational Awareness capabilities and expand Rendezvous and Proximity Operations techniques. In July 2016, AFRL transferred satellite control authority to the 3rd SES. This gave the 50th Space Wing a new level of authority over the satellite to dictate tasks and commands directly to the equipment. Artistic rendition of the U.S.A.F. 's ANGELS satellite. Cork explained the reason for the final command ceremony was due to completion of end-of-life experimentation, no longer having necessary resources available to extend the satellite’s life, as well as freeing up personnel for future missions. The ceremony was to confirm all passivation was complete and declare ANGELS as mission-ended. 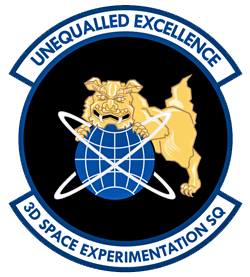 The 3rd SES invited Dr. Joel Mozer, Air Force Space Command acting chief scientist and technical advisor, to send the final command. The squadron explained this as fitting because Mozer had satellite control authority during the beginning stages of ANGELS. During the final contact with the vehicle, the satellite was commanded into the safest, lowest energy state possible. This means all fuel was depleted from the fuel tanks, the batteries were unable to hold a charge and the vehicle was in a spin-stabilized configuration. Amsden addressed his team and guests, while looking back on the satellite’s journey from transfer to final command. While 3rd SES may have recently decommissioned ANGELS, the squadron continues to look forward into the future. They are gearing up for new programs to include the EAGLE/Mycroft space vehicles, scheduled to launch in April of 2018.